Recipe from Katie Taylor, Chief Customer Officer, Wal-Mart, Hanesbrands, Inc. This healthy appetizer takes only minutes to prepare but offers a lasting taste. Simple ingredients are combined to make an easy-to-serve dish. 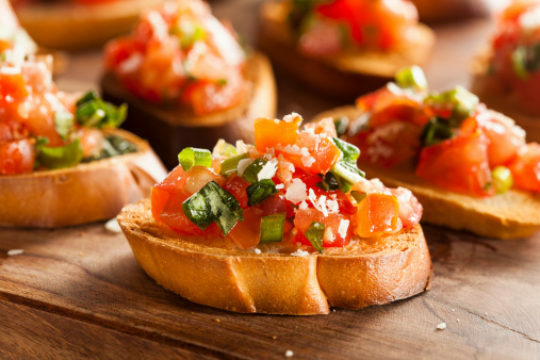 A combination of tomatoes, olive oil, basil, and parmesan cheese cover bread, making bruschetta a tasty snack or a complete meal. In a medium bowl, combine tomatoes, olive oil and basil. Place bread on a baking sheet and top with tomato mixture. Bake in preheated oven for 8-10 minutes, or until bottom of bread is browned. Yields 6 servings per recipe.